Editors from Grindr’s news platform Into issued a statement yesterday to press, noting its entire editorial staff, along with related social-media staff, had been fired. The Advocate was the first to report on the story. Grindr’s management stated it’s moving from the current editorial structure to one reliant on video. The gutting comes less than two years after the publication’s launch. 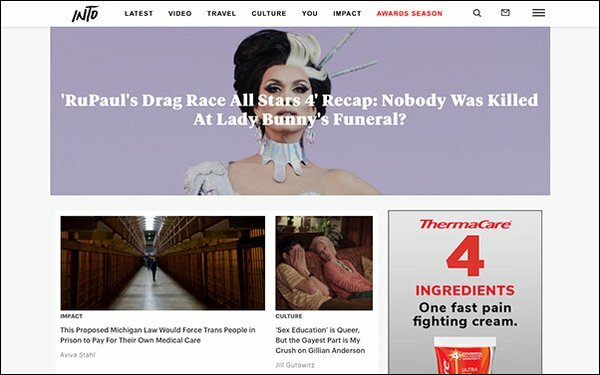 “In that time, we built one of the largest LGBTQ platforms in history — using the power of social media to reach queer audiences around the globe. Others took notice. Our reporting was cited in notable publications like The New York Times, Washington Post and Vanity Fair,” the statement reads. “We aimed to give a voice to those who need one now more than ever, a platform for them to see themselves represented wholly,” the editors stated. In addition to providing a robust editorial product, the publication advocated for LGBTQ films to grant access to queer media publications, following years of being ignored by studios. “In doing so, we further proved what queer people have shown for decades: There is an audience, a desire and a hunger for LGBTQ stories told by LGBTQ people. This includes all letters of the queer alphabet, including intersex, bisexual, pansexual, agender, and asexual communities that had long felt marginalized by mainstream media. Recently, Into’s editorial team and its management came into conflict after Grindr’s president Scott Chen made anti-LGBTQ remarks on Facebook in a post about marriage and an Into reporter singled him out in a piece. The outlet was also involved in turmoil following a piece that called Ariana Grande’s “Thank U, Next” video transphobic and racist. Following Chen’s remarks, Zach Stafford, formerly Into’s EIC, left the publication. He’s now EIC at The Advocate. Grindr’s head of communications Landen Zumwalt also left the company following Chen’s post. Separately, Wired has cut five positions from its masthead, including senior features editor Alexis Sobel Fitts, senior writer Brian Raftery and digital producer Lydia Belanger. The staff of the magazine also moved to a new floor of 1 World Trade Center following the announcement. The layoffs are the first under EIC Nick Thompson, who took over in January 2017. The magazine also lost five staffers who were cut as part of Conde Nast’s Snapchat-related layoffs last November.